The two firms involved in the court battle are Richmor Aviation, a New York-based company that operated charter planes, and Sportsflight Air, which served as a middleman between charter firms like Richmor and companies that needed planes—in this case, the government contracting giant DynCorp. The plane that Richmor provided to SportsFlight, with the tail number N85VM, was just one of many used in the extraordinary rendition program. But N85VM, which was owned by Boston Red Sox co-owner Phillip Morse, was particularly notorious not only for being owned by Morse but also for being used in the case of Abu Omar, an Italian imam whose bungled 2005 rendition Peter Bergen covered for Mother Jones. (Afterward, the Italian judiciary sought to prosecute the CIA agents involved in the rendition. I interviewed Steve Hendricks, who wrote a book on the affair, last year.) The Post and the AP stories both note that the Richmor-Sportsflight records show N85VM traveling all over the world, with stops not just in Guantanamo Bay, but also in foreign countries famous for hosting secret CIA prisons or torturing prisoners on America’s behalf. Lawrence Wilkerson, who was chief of staff for Secretary of State Colin Powell from 2001 to 2005 during the Bush administration, said he was not familiar with the Hogan letters and had not been aware of any direct State Department involvement in the CIA’s rendition program. Wilkerson said the multiple signatures would have raised questions about the documents’ authenticity. 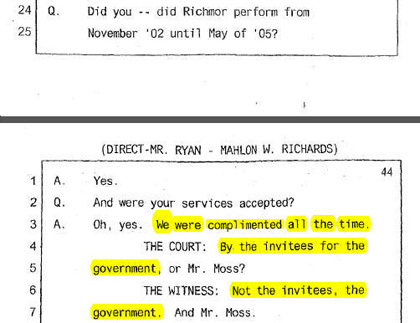 No, I imagine the government’s “invitees” would not appreciate the service that Richmor was providing.